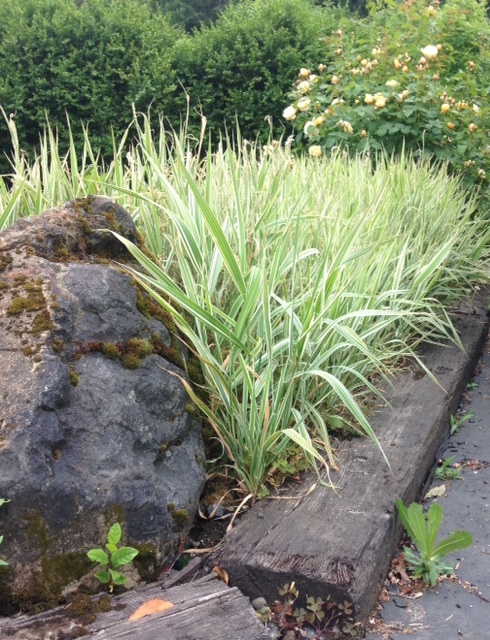 Resistance is Futile-Plants that take over your landscape. 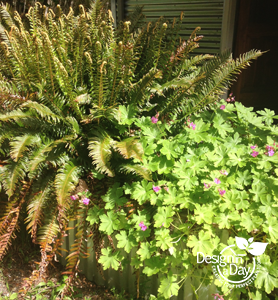 This blog is about attractive plants that take over your landscape. They are tempting and for sale at most garden centers. Star Trek The Next Generation came out 20+ years ago but I was busy building my landscape design practice and raising a stepdaughter so I missed the whole thing. Maybe I’m just going to seed as I recently watched all seven seasons in short order. I encountered the Borg and was impressed with their ability to take over a universe. The Borg remind me of certain plants that will happily assimilate your entire garden and need to be avoided. Here’s a list of plants that are as devastating as the Borg and good at propagating their own kind without any assistance. They have an aggressive spreading growth habit and yet they are still sold at most nurseries and garden centers in spite of their thuggish nature. Be warned. 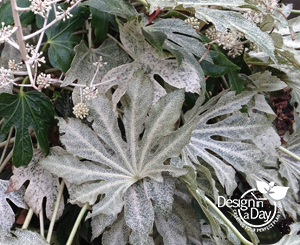 Houttuynia cordata ‘Chameleon’ – I’ve never known anyone who (once it was planted ever managed to get rid of it. It is famous for aggressive roots that will grow through other plants and overpower them. It can seed although it hasn’t in any of my clients gardens because I never use it. Look at how cute the variegated leaf is! Imperata cylindrica ‘Red Baron’ or ‘Rubra’- Japanese blood grass is a spreader but it can be dug out and eventually (as in years of work later) be banished but don’t sacrifice your time to this plant…you will be sorry!! Ribbon Grass, Phalaris arundinacea, is a plant that can be very difficult to eradicate but if a designer suggests it for a contained area that doesn’t mean they are a newbie. It is planted in a parking lot that I frequent. It’s been trapped there over 9 years and has not escaped. I myself have never used it in a design but it is very very low maintenance. Here is an article regarding success in killing the ribbon grass. This stand of Aspens (Populus tremuloides) started out as one trunk! Aspen trees, Populus tremuloides, are beautiful in a forest but not good for tiny city plots. One tree will become many and fill your soil space with invasive roots that lift walkways, invade foundations and water lines and leave companion plants with no water or nutrition. 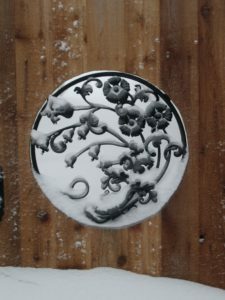 See this great article from designer pal Beth Goodnight regarding the evils of aspen and some alternative suggestions. If mint gets away from you – you will never get rid of it. Some people plant it in a pot and keep it on a concrete patio. The roots can escape from the pot and once it spreads in your soil you will have it forever so I never set my pot of mint into a planting bed. I like having mint for soups but it is strictly a container plant. 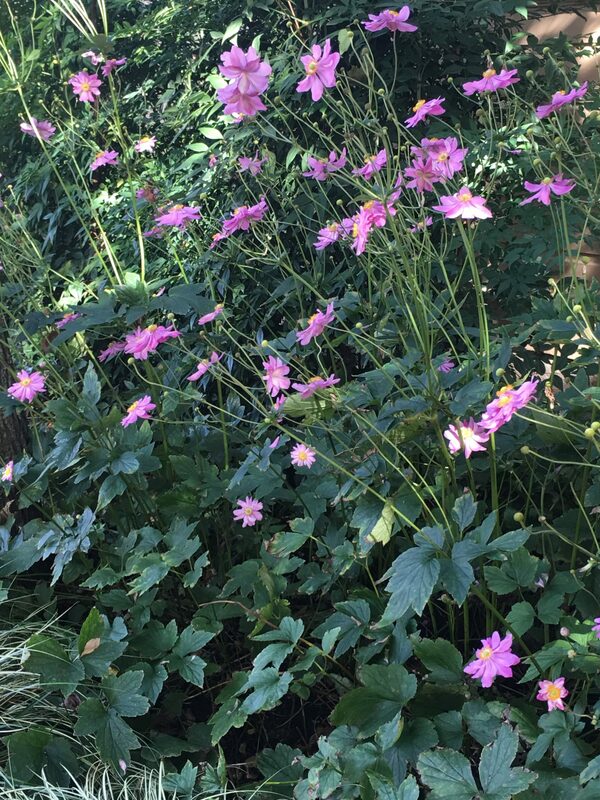 Japanese anemone, Anemone sp., should only be used by experts. This one is very very seductive and over the top beautiful. It travels by root which is the problem. I like to use it in very low maintenance planting plans/landscape designs and in parking strips where it is easily contained. It doesn’t seem to invade the lawn so I’ve used it in plant borders too. 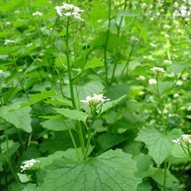 Bishops weed, Aegopodium podagraria, should be planted by people who know exactly what they are in for. 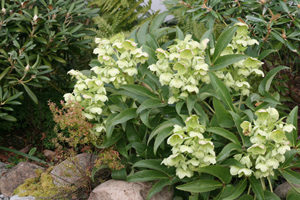 It can be contained in the parking strip or a low maintenance planting where you have nothing but shrubs. 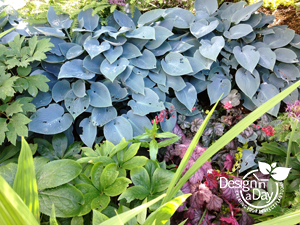 Large shrubs with bishops weed as a ground cover can be a functional landscape choice. If I use it I have a rule: You are not allowed to ever give a start of it to a friend. There are, of course, many plants besides my short list that should be avoided or used with caution. 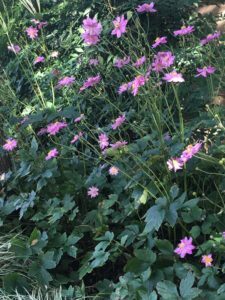 These plants are the stars of this blog because they are so attractive, tempting and readily available at your local garden center. Slugs and snails do a lot of damage in Portland gardens. I was never thrilled with my options for dealing with slugs and snails. In the 80’s we had the typical little gray French slugs and snails in our gardens and they were pesty enough. I had often just hand picked them and kept the numbers down. Then in the 90’s we started seeing California Brown Snail and they added significantly to the total damage. It was too much for me to manage organically. The beer bait didn’t work for my garden on a city sidewalk in NW Portland’s Nob Hill District. Dogs would drink the beer which is NOT good for them and the traps looked tacky too. Using the snails for escargot doesn’t work as a pest management practice since the typical serving is six 1 ½” snails per person. My family would never go for Escargot anyway. They are not adventurous diners. 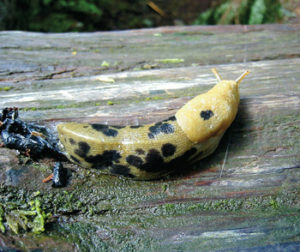 The banana slugs only eat leaves that are decaying or broken. They also pollinate native spring flowering plants on the forest floor. I did not like leading them to slaughter. I started using the “pet safe” iron phosphate slug bait. It was an easy method to cut down the population compared to beer baiting or hand picking them. The problem with slug bait is that it does not discriminate. It would lure innocent NW native banana slugs to their death along with the real culprits that did the damage to my plants. Another problem with slug bait is it doesn’t protect your plants immediately. Slug bait lures the slugs to the bait but does not kill them right away. They have time to do a lot of damage before they sicken, stop feeding and then die. The major issue is the iron phosphate remains in the slug’s body and breaks down and ends up in the soil. This iron residue left behind in the soil created a toxic environment for worms, the creatures who keep our soil healthy. I didn’t notice it myself until I got raised beds in my community garden. I noticed a steady decline in the population of worms in my beds. Daizzie inspecting the copper wire which keeps slugs out of my veggies by producing an electric shock. There is an inert ingredient in the pet safe slug bait that combines with an active ingredient to kill earthworms. They die from iron poisoning. The combination was also causing harm to wildlife and to small domestic animals so it was time for me to make a big change. 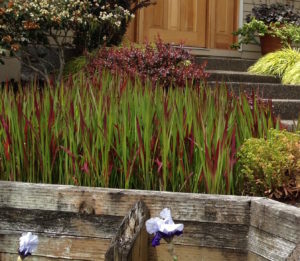 Ann Lovejoy is a trusted resource and treasure for Pacific NW Gardeners. 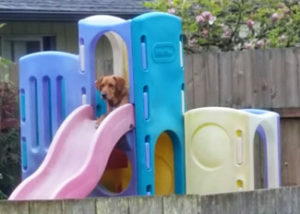 She is the one that made the connection between the iron phosphate “pet safe” slug bait and the harm it was doing. Read more about how slug bait kills worms. She made several suggestions for what to use instead of slug bait. My favorite is using liquid caffeinated coffee sprayed onto plants as a repellent. I tested it this past fall to great success. I was able to protect my kale crop from slugs. I purposely sprayed coffee on only half the plants as a test. The plants I did not spray were missing half their foliage. The plants I sprayed had no holes or missing foliage. I sprayed at least once a week during the fall rains. Ann says a direct spray of coffee will kill the slugs but I could not tell if this was a success. 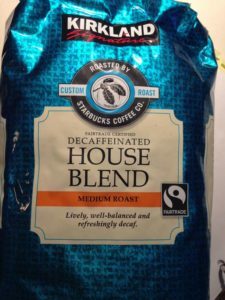 I sprayed the coffee directly on slugs but when I came back the next day the sprayed slugs were no where to be seen. They may have crawled off and quietly expired but I was not sure. Maybe my coffee wasn’t strong enough. I will do more testing now that the soil has warmed up enough for new slugs and snails to hatch. I’ll post again and share what strength of coffee it takes for an obvious demise. I can’t wait to share this with my landscape design clients. Many clients have pets. The fact that pet safe slug bait is toxic needs to be shared. Scrub copper wire with wire brush – slugs can cross the wire if it’s oxidized or dirty. Another option to deal with slugs in raised beds is to line the edge of the bed with copper. I used a copper ground wire but you can use sticky copper tape available at most garden centers and it will last maybe one garden season if you are lucky. It is easy to buy and apply to your raised beds, pottery and containers. What’s the difference between slugs and snails? 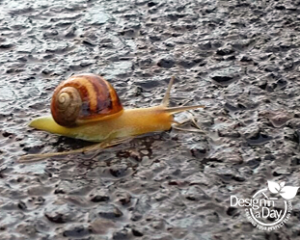 Slugs and snails are pretty much the same animals according to Robin Rosetta, Associate Professor at OSU. Over time slugs evolved out of a hard shell so they could move through cramped spaces and allow them to get down into the soil to find food and protection. Apparently, there is still sort of a shell under their hump like mantle. Snails still have a shell and so are restricted to above ground activities. They use their shells to survive inclement weather and are protected from some enemies and predators. Winter is just around the corner here in Portland. Here are 5 timely tips to help you care for your landscape right now. Slugs Last chance to knock out slugs! Control your slug population now in late fall. They lay thousands of eggs that will hatch in spring. I’ve got bad news about using the so called pet safe slug baits. New science says it kills your earthworms and can sicken your pets and other animals. Control your slugs with beer traps or even better an instant coffee spray. Yup coffee! Fill a spray bottle with strong instant coffee or any coffee except de-caf. 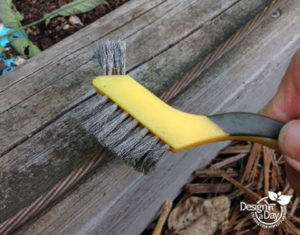 Spray the leaves of plants they prefer and any slugs or snails you see. I grow lots of winter greens here in NW Portland so I’ve been out there spraying down the leaves of my beautiful Dinosaur Kale plants to protect them now. Spraying coffee once a week in fall and early winter makes a big difference in the spring hatch of slugs. Read more about why slug bait harms worms. Its the caffeine that kills slugs or snails. Instant coffee works well. Mulch. If you only do one thing to improve your soil and care for your plants, mulching is the biggie. Schedule your winter mulch application for the last week of November to mid-December or hire someone to blow in your mulch. Companies such as Bark Blowers will blow in mulch including the newer “living” mulch products that I prefer. One company that provides mulch inoculated with beneficial bacteria is Natures Needs, a product called Recology Compost. McFarlane Bark, Mt Scott Fuel and Grimms Fuel supply basic mulch products. Did you mulch just 2 inches deep? Great! Now go and unbury the crowns of your plants so they don’t die from rot during our wet winter. Burying plants with mulch might be a good practice in Vermont or Montana but not here. 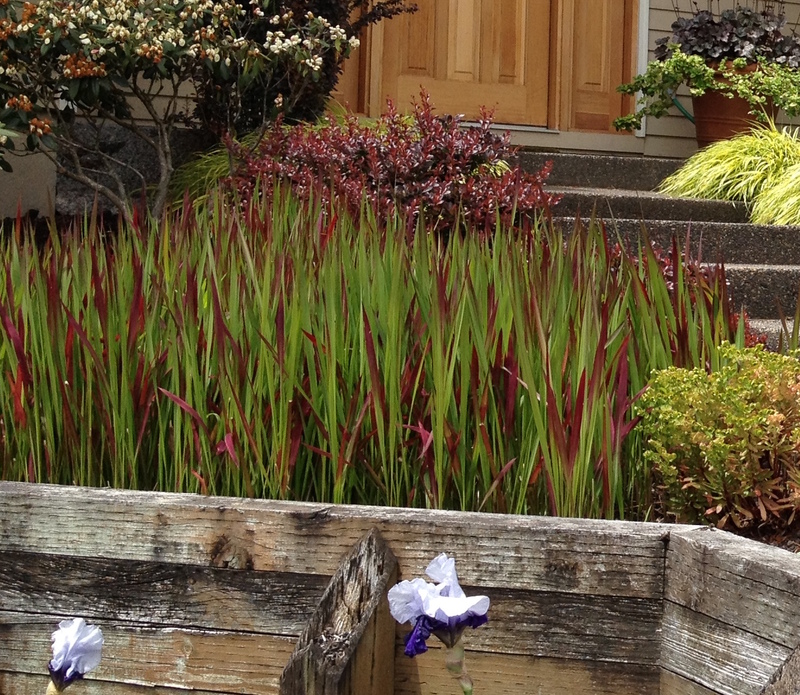 Landscape Design in a Day client’s custom gate. Pruning knowledge There are many plants that should not be cut back in the fall and winter. There are many perennials and grasses that can be cut back to create a more attractive winter landscape. This is a case by case basis which drives new gardeners crazy. 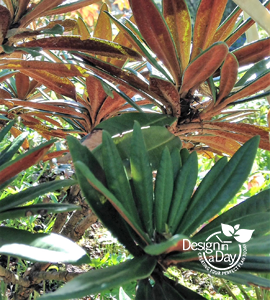 Consider consulting with your garden designer who can teach you what to do to your plants and when. It feels good when you know what to do. Protect your pottery The best winter protection for your pottery is proper drainage and location. Make sure water drains through the pots hole and doesn’t back up. If water sits in the bottom and it freezes, good bye pot. I have had Vietnamese high fired pottery outside and intact for over 15 years. I always put drainage material in the bottom of the pot and a piece of flagstone under the pot or I use those little pottery feet. If I have expensive pots where they will get east winter wind, the kind of wind that freezes rain to ice on the power line, I would move them into a protected area for winter right now. I hate to even think about that kind of weather but we get our share here in Portland Oregon, especially in January. Its hard to pay attention to the weather report, and besides who wants to move heavy pots around when its icy cold out? Not me.